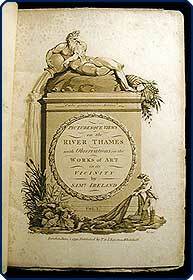 Beauties of the Thames Illustrated Ireland, Samuel. 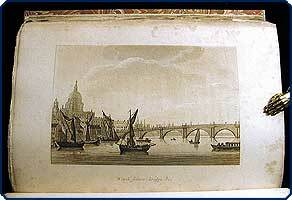 Picturesque views on the river Thames, from its source in Glocestershire to the Nore; with observations on the public buildings and other works of art in its vicinity. 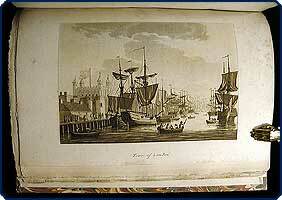 London: T. & J. Egerton, 1792. 4to (25 cm, 9.8"). 2 vols. I: Add. engr. t.-p., xvi, 209,  pp. ; 1 map, 27 plts., illus. II: Add. engr. t.-p., viii (incl. t.-p.), 258,  pp. ; 1 map, 25 plts., illus. EVERYTHING You Need to Know about the Nobility, & Other Tuscan Matters [Italian Almanac]. Almanacco Toscano 1846. Firenze: Stamperia Granducale, . 12mo (14.6 cm, 5.75"). Engr. t.-p., 689,  pp. ; 6 plts. Jack's House & Jack's Malt — A “Chapbook” Tale (Jack)! The history of the house that Jack built, a diverting story. London: Harris & Son, 1821. 12mo (16.6 cm, 6.5"). ff. ; col. illus.  One of Harris's “most approved novelties for the nursery,” from that publisher's “Cabinet for Youth” series; a chapbook in all its feeling though a bit larger in size and differently formatted from most, with its classic story here having 17 hand-colored wood engravings, including the title-page vignette. Each leaf, printed on one side only, bears a large, neatly and skillfully colored illustration (with the exception of the unadorned publisher's advertisement page), starting with Jack's very attractive house and its “Jack”-labelled malt sacks and ending with a large cut of Sir John Barley-corn (looking rather like Henry VIII). The second edition, following the first of the previous year. Harris published his fifth and last in 1830. Persian/Tajik Allegorical Poetry — Notes & Handsome Illustration Jami. (Edward FitzGerald, trans.). Salaman and Absa. [An allegory]. Leigh-on-Sea, England: F. Lewis, ltd., (1946). Small 4to (25.5 cm; 10"). 64 pp., color illus.  This classic allegorical poem of Persian/Tajik literature comes from the pen of Jami (1414–92) and was translated in 1856 by Edward Fitzgerald (1809–83), the famed translator of “Rubaiyat of Omar Khayyám.” The illustrations here, in color, are by E.A. Cox. Up the THAMES in a Rowboat Jerome, Jerome K. Three men in a boat to say nothing of the dog! Ipswich: Pr. by W.S. Cowell Ltd. for the members of the Limited Editions Club, 1975. Oblong 8vo (23.6 cm, 9.3"). xv, , 174,  pp. ; 12 col. plts., 2 double-p. col. plts.  Limited Editions Club rendition of this classic work of English humor, in which George, Harris, and Jerome (all “seasoned hypochondriacs,” as the newsletter puts it) take Montmorency the dog along with them for a boating trip up the Thames that turns out rather more complicated than expected. Stella Gibbons (a great choice) provided the introduction, and John Griffiths produced the 12 full-page and two double-spread color plates, as well as numerous black-and-white ink drawings. John Lewis set the horizontally formatted work (so done “because so few rivers in England are perpendicular”) in Modern Extended and ultra-bold Bodoni type; it was printed by W.S. Cowell Ltd. on Abbey Mills cream-colored eggshell paper, and snazzily bound in gaily striped scarlet, slate, and yellow linen. This is numbered copy 733 of 2000 printed; it is signed by the artist at the colophon. The appropriate LEC newsletter is laid in. Signed Binding on a Reward Volume from a Teacher Johnny and Maggie, and other stories. Boston: Crosby, Nichols, & Co., [1852–60?]. 16mo (15.3 cm; 6"). 48, 14 pp. (publisher's catalogue). Binding: Signed “Liebherre, GRA.” Midnight blue or purple cloth with blind-stamped boards and richly gilt-stamped spine. A Comic Romp — An Oxford, Meynell LEC Production Jonson, Ben. Volpone, or the fox. Oxford: Printed for the members of The Limited Editions Club at the University Press, 1952. Folio. (30 cm, 11.75"). , v–xxv, , 163,  pp. ; 17 plts.  Ben Jonson's first great comedy was produced in 1605, after a brief stay in prison for offending the new king of England, James I. Jonson's reputation as a great dramatist lies primarily upon the brilliance of this play and three or four others. This volume's illustrations are watercolors by René ben Sussan, whose signature appears on the colophon. Initially drawn in black, they were reproduced by the collotype process in the studio of Louis Duval in Paris; the printed sheets were then colored by hand, through stencils, by Maurice Beaufamé. The introduction is by Louis Kronenberger. This edition, which is limited to 1500 copies, was designed by Francis Meynell and printed by Charles Batey, Printer to the University at Oxford. Meynell's choice for the font is the rarely used Fell, which can only be used at Oxford; the letters are large and have a rather archaic feel to them. The binding is quarter rust-colored linen, stamped in gold, with sides covered in linen printed with a repeating pattern. 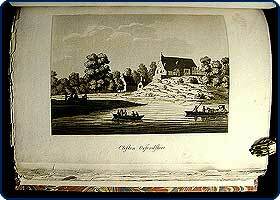 From New England to the NILE [Justel, Henri, ed.]. Recueil de divers voyages faits en Afrique et en l’Amerique, qui n’ont point esté encore publiez.... Paris: Louis Billaine, 1674. 4to (23.7 cm, 9.4"). á4ã4A–Z4Aa–Hh4 Ii2Kk4Ll21§–4§45§2 **A–**C4 a2b–g4 *A–*K4L2;  ff., 262, 35, [1 (blank)] 23, [1 (blank)], 49, [1 (blank)] pp.,  f., 81, [1 (blank)] pp., 3 fold. plans, 4 maps (3 fold. ), 9 plts. �First edition of this collection of significant and interesting voyages, edited by a scholar and book collector who served in the employ of Louis XIV before being appointed Keeper of the King’s Library at St. James by Charles II. The compilation includes French-language travelogues of Barbados, the Nile River, Ethiopia, “l’Empire du Prète-Jean,” Guiana, Jamaica, and the English colonies, with illustrations including banana and palmetto trees, Caribbean pottery, and maps of New England, Jamaica (including Florida and the Antilles), and Barbados. Some of both the voyages and the maps make their first published appearances here—among them the New England map depicting the Maryland and Virginia coastlines, engraved by R. Michault after one contained in Richard Blome’s Description of the Island of Jamaica, part of which work appears here translated into French. Altogether, a volume notable both for its strong African and North American content and for the aesthetic appeal of its plates and pleasingly ornamented typography. “A Remarkable Piece of Apparatus . . .” Kafka, Franz; Michael Hafftka, illus. In the penal colony. South Portland, ME: Silas Andrus, 1987. Small 4to (26.5 cm, 10.5"). , 53,  pp. ; 4 plts. (incl. in pagination).  Starkly handsome Limited Editions Club production from especially good designers and presses: Translated from the German by Willa and Edwin Muir, Kafka's disturbing short story appears here in a volume designed by Benjamin Shiff, set in monotype Walbaum at the Out of Sorts Letter Foundery in Mamaroneck, NY, printed on mould-made Magnani paper at the Shagbark Press in Maine, and hand-sewn and hand-bound by Carol Joyce. The work is illustrated with four dark, abstract lithographs done by painter Michael Hafftka and printed on hand-made Japanese paper. This is numbered copy 46 of 800 printed, signed by the artist at the colophon. Binding: Parchment paper–covered limp boards with sewing bands left visible, in original tan linen cloth–covered clamshell case with printed paper spine label. “In Search of ”  A Brave & Sad Account Kane, Elisha Kent. Arctic explorations: The second Grinnell expedition in search of Sir John Franklin, 1853, ’54, ’55. Philadelphia: Childs & Peterson, 1856. 8vo (23.5 cm, 9.25"). 2 vols. I: Frontis., add. engr. t.-p., 464 pp. ; 1 fold. map. , 11 plts., illus. II: Frontis., add. engr. t.p., 467,  pp. ; 1 fold. map, 1 map, 7 plts. For the Amateur Botanist Keeler, Harriet L. Our native trees and how to identify them: A popular study of their habits and their peculiarities. New York: Charles Scribner's Sons, 1917. 8vo (19.9 cm, 7.875"). xxiii, 533, [5 (4 adv.)] pp. ; illus.  Botany in a beautifully decorated binding. Harriet L. Keeler was a life-long educator and amateur botanist, having published seven nature guides between 1894 and her death in 1921. So-called “recreational” botany was popular among women towards the end of the 19th century — “scientific” botany was out of their grasp at this time — affording Keeler a wide readership. Her study of native trees, which provides extensive descriptions and Latin names, influenced many future nature writers and was reprinted over a dozen times. This is the ninth edition. 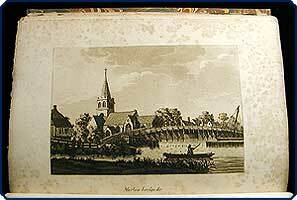 The text is illustrated with 178 photographic reproductions of leaves, branches, flowers, etc. and 162 reproductions from drawings. Binding: Publisher's light green cloth with gilt lettering to front board and spine; grey, black and beige–stamped forest to front board. Provenance: Inked inscription on front fly-leaf: “Elsa C. Fueslein, with the love and congratulations of G.S.S., Oct. 19/18.” Bookplate of Elsa Carla Fueslein on verso of front free endpaper. A Great Bibliographer's “Tools” Keynes, Geoffrey. Bibliotheca bibliographici: A catalogue of the library formed by Geoffrey Keynes. London: Trianon Press, 1964. Large 8vo (28.8 cm, 11.375"). xxiii, , 444 pp. ; 45 plts.  As precise and extensive a catalogue as one might expect from the great bibliographer: “[My] library is not a random collection of books, but is rather a workshop furnished with the tools needed for the fabrication of the bibliographies that bear my name” (p. vii). This first, limited edition was printed in 500 copies at the Curwen Press and distributed by Bernard Quaritch Ltd.; it features 45 collotype plates of particularly notable title-pages and illustrations from Keynes' collection. Tom's Journey from Chimney-Sweep to “Great Man of Science” Kingsley, Charles; A.E. Jackson, illus. The water babies. London: Humphrey Milford, Oxford University Press (pr. by R. Clay & Sons, Ltd.), 1920. 8vo (23.9 cm, 9.4"). 252 pp. ; 16 col. plts.  The first edition with Alfred Edward Jackson's delicately shaded illustrations: 16 color-printed, mounted, and tipped-in plates, as well as numerous black and white vignettes. Jackson (1873–1952) was a notable figure of the Golden Age of British children's illustration, providing beloved artwork for such classics as Alice's Adventures in Wonderland, Tales from the Arabian Nights, Robinson Crusoe, Mother Goose Nursery Tales, and the present fairy tale — the Rev. Kingsley's best-selling parable of moral evolution. Binding: Publisher's light blue cloth, front cover and spine with child and fish vignettes stamped in gilt and dark blue, in original light blue dust jacket with the same vignettes in blue. Janus Press Edition — Signed by Poet & Photographer Kinnell, Galway. The Seekonk woods. Concord, NH: Pr. at the Janus Press for William B. Ewert, 1985. 8vo (26.7 cm, 10.5"). pp. ; 3 plts.  First book-form printing of this poem, following its initial appearance in The New Yorker; its Rhode Island–born author (1927–2014) was often compared to Walt Whitman, and this piece highlights his signature earthiness. The text is illustrated with three full-page photographs by Lotte Jacobi, selected from her archive at the University of New Hampshire and printed from the original negatives. The text was designed by Claire Van Vliet, set by hand in Trump Mediaeval, and printed by Van Vliet and Christy Bertelson on Barcham Green Tovil paper at the Janus Press in West Burke, VT. This is numbered copy 102 of a total of 170 printed, signed at the colophon by both Kinnell and Jacobi. Educating German-American Boys & Girls in 1809 Kleine Erzählungen über ein Buch mit Kupfern: oder Leicht Geschichte für Kinder. Philadelphia: Gedruckt [beyJacob Meyer] für Johnson und Warner, 1809. 24mo (14 cm; 5.5"). ff., illus.  Sole American issue of this German-language edition of Little prattle over a book of prints. A wonderful picture book for children with wood engravings by Alexander Anderson, this small volume contains short stories that deal with conduct of life, animal welfare, and accidents that befall children (like falling through the ice on a pond). The title-page wood engraving is signed, “A” (i.e., Alexander Anderson) as are some of the other 18 wood engravings. The last two pages contain printings of the alphabet in majuscule and miniscule fraktur, the two- or three-letter vowel and consonant combinations of German, and the numerals from 1 to 0. 158 (Religious) Images from TWO Fantastic Designers Koch, Rudolf, & Fritz Kredel. Christian symbols. San Francisco: Arion Press, 1996. 4to (28.6 cm, 11.25"). , 158,  pp. ; illus.  “One hundred and fifty-eight graphic images from the history of Christianity.” These important religious emblems drawn by Rudolf Koch with the help of Fritz Kredel are presented in a bound book from the Arion Press for the first time. They were previously published as a folder of plates between 1932 and 1935; the reproductions here were reduced to ninety percent of the original. Koch intended for the book to be used as a reference for other artists and churches. Typographer Koch (1876–1934) and graphic designer Kredel (1900–73) previously collaborated on their well-known Book of Signs. Koch's preface, translated to English from the original German by Kevin Ahern, is provided, as well as a foreword from Andrew Hoyem. The prospectus is laid in. This is numbered copy 110 of 500 printed and signed at the colophon by the artist. Janus Press Livre d'Artiste Leporello Kronfeld, Susan. Spaghettiana. West Burke, VT: The Janus Press, 1976. 8vo (26 cm, 10.2"). f.
 Unusual and delightful Janus Press production: one long accordion-fold (i.e., leporello) rendition of a sinuous linecut illustration, printed from six original drawings by by Susan Kronfeld. The printing was done by Claire Van Vliet and Nancy Southworth at the Stinehour Press, and the binding by Jim Bicknell; the linecut is printed in black, and the text portions (title, colophon, and instructions) in violet, red, and silver. This is numbered copy 52 of 150 printed, signed at the colophon by the artist.